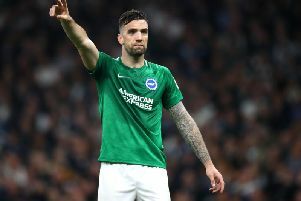 Defender Shane Duffy believes Brighton's remaining games this month could turn out to be season defining. The Seagulls entertain struggling Burton Albion on Saturday, before they host mid-table Ipswich on Tuesday. A trip to play-off chasing Barnsley then follows, before Albion complete the month with fellow promotion hopefuls Reading and Newcastle visiting the Amex. Duffy said: "These games are massive because you're getting to the months that can define the season. "We're confident that at home we can beat anyone. That's what we've got to believe and we'll see what happens." Albion ended a three-game losing run on the road with a 3-3 draw at Brentford on Saturday and Duffy said: "Our away form is frustrating. We've been talking about how we play away and how it's different to home games and I still think we can do a lot better away. "It was a good point in the end just to break that little duck. We've had some fantastic away results this season as well, so it's just a little blip. "It's a long season and you get these little blips and this was ours. We've got two home games now to try to get six points and hopefully get on another run."